I attended a class at LBR 614 last night, taught and hosted by Jeff and Jimmie (we’re on a first name basis now). The topic was “Restaurant Secrets,” and to my surprise, most of the discussion and questions centered on where the restaurant food is sourced. Jeff let the fifteen students attending in on a little trade secret—if you leave chemicals and processing out of the food the food tastes good. Who knew that red dye and other chemicals were added to super market ground “beef” so that it looks more appealing? I knew that, but many in the class didn’t. They were astonished. The class then wanted to know if they could buy meat from Jeff’s provider, and if not, where could they find meat that doesn’t include red dye? One lady admitted to adhering to “the redder the better” philosophy of ground beef buying, thinking that the redness of the meat indicated freshness. Another secret from Jeff—his ground beef only lasts three days in the refrigerator (because it’s unprocessed and fresh! ); most super market meat has a much longer, chemical-induced shelf life. Jeff went on to touch on many other restaurant secrets, from food storage, to how to cook the perfect roast chicken (500 degree oven for the first half hour is the key to crispy skin! Oh, and buy yourself a meat thermometer. You must have a meat thermometer). Attending the class made me realize that I need to get some local resources on here stat (to borrow a medical term). People want to know where they can buy wholesome, local food! And I’m so glad! I already have some sources for local produce, meat, and seafood and I promise to post those here in the next week or so. When spring and summer hit, I will have even more places for you to visit in your own search of local, seasonal food. Photo shoot! Jimmie and Jeff took a moment away to pose with me. Okay, so let me jump down off my local food soap box for a moment and switch gears to tell you about two things: appetizers and lunch (both at LBR 614. I told you, it’s my new favorite). At the end of the class, Jeff and Jimmie presented a beautiful array of appetizers, including citrus marinated olives (done in house), country ham, crab dip, ham biscuits with cherry preserves, and ham salad. Let me take a moment to talk about this ham salad. Yes, ham salad is what I said. This ham salad (said it again) was served ice cold with toast points and it was…refreshing. Kind of an odd things to say, but it’s true, ham salad can be refreshing if Jeff makes it. I vote for a ham salad sandwich to be added to the menu. Now on to lunch. I took my parents and my husband to lunch at LBR 614 today. Joe (the husband) ordered the Cuban sandwich. It comes with three different kinds of pork and house-made pickles. House-made pickles!! 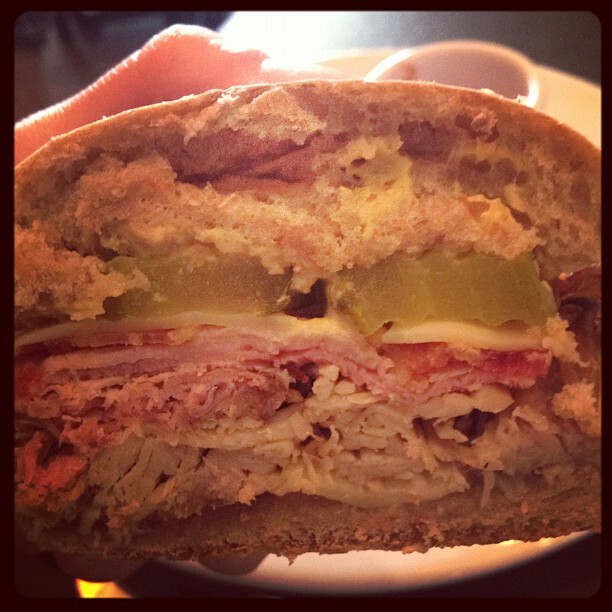 Pulled pork, ham, bacon, swiss cheese, dijon mustard, and house made pickles make this sandwich oh so delicious. I would explain in detail what everyone else ordered (and devoured), but I won’t because you need to go there yourself. You will not be disappointed in the Southern-inspired menu with a French flair, and you might even learn a little something about local food in the process. Oh, and if you see Jimmie (he’s the tall, welcoming one with the killer smile. Can you say, McDreamy? ), tell him Rachel sent you! Glad to hear it, Sarah! If you’re in the area, check out this restaurant. Like I’ve been saying, IT’S GOOD! We are excited and happy that people are discovering us and enjoy the menus and services we offer. We love and are passionate about what we do. It comes from the heart. We have the best intentions and enjoy sharing what we grew up on. Our recipes and beliefs come from our childhoods with our parents and grandparents. Memories of after school cooking– Jeff with his grandmother Dot, who died shortly before we opened LBR 614 and me with my father, Jim, who died several years ago. Spending quality time that we maybe didn’t realize was quality time at those moments in our lives. We believe you can have an adventure at LBR 614 and have quality time and make memories with friends, family, co-workers and yup your children. It is great to see that happening and we enjoy the posts and photos on our FB page. Rachel, what can we say to you that is larger than Thank you?! You are our first official review (2 now) and it was a wonderful, unsolicited surprise that is real and your own words. In my opinion, it is the best form of advertising along with our other wonderful guests that post, write, spread the word about us and bring in their friends, families and children to LBR 614. We do NOT take it for granted. Here is what we are offering for readers of your blog…Until the end of March 2012, you bring in a copy of any of Rachel’s posts about LBR 614 and RECEIVE 10% OFF your check. See you all soon. Love the back story, Jimmie! I am indebted to Jeff’s grandmother, Dot, for training him so well. 🙂 He is a genuis! I will be in soon with some more of my family Thanks for posting a discount for the readers of my blog – LBR 614 is AWESOME! I eat at LBR all the time. 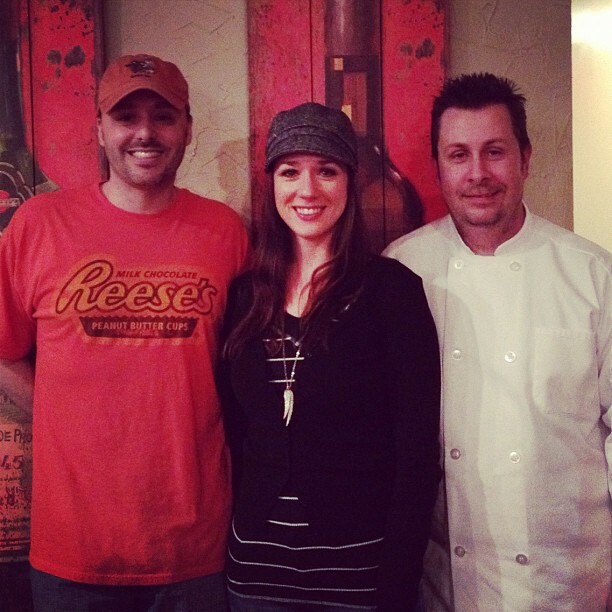 I thoroughly enjoy the food, the atmosphere and the conversations with both Jimmie and Jeff. Thanks for mentioning the restaurant – I hope this is an avenue for others to discover LBR. FYI – we are doing a fundraiser for the Little Sisters of the Poor on March 27th – 30% of the proceeds go the the Little Sisters (the servers are giving 30% of their tips as well.) Spread the word and get your reservations. Hi James, I’m not surprised that LBR is donating their restaurant for a fundraiser like this. They care about their community! I’ll spread the word. Thanks! Thanks for checking out my post on Festival Fun in NYC. When I read this I was immediately intrigued when I read the first line about Grey’s Anatomy (love that show) and as I read on I began thinking about all the times I’ve driven right through Delaware. This place sounds awesome!. I’m already making plans to explore the area and visit the restaurant. Most people do pass right through Delaware! We have beautiful beaches (Cape Henlopen State Park is gorgeous) and some excellent local food and farms. If you ever make it to the restaurant, let me know! wow….good info – thanks for sharing – maybe I can eat there once we leave Alaska and head back to NC! Thank you! It’s worth the stop! Safe and happy travels to you!